Christmas in Vancouver is the season for decking the boughs--and everything else--with millions of twinkling lights. Vancouver attractions and neighborhoods light up the holidays with incredible displays that are wonderful fun for all ages. The best Vancouver Christmas light displays include the immensely popular Festival of Lights at the VanDusen Botanical Garden and Bright Nights in Stanley Park, but there are free light displays, too. Use this guide to find the best places to see holiday lights in Vancouver. Want a touch of adventure with your Christmas lights? Capilano Suspension Bridge Park celebrates the winter holidays by decking out its major, adrenaline-pumping attractions, including the Capilano Suspension Bridge and CLIFFWALK, with zillions of sparkling holiday lights. The lights are on from November 22, 2018, through January 27, 2019. It's closed on Christmas Day. One of the best Vancouver Christmas lights displays for kids, Bright Nights is also one of the top 5 Vancouver holiday attractions. 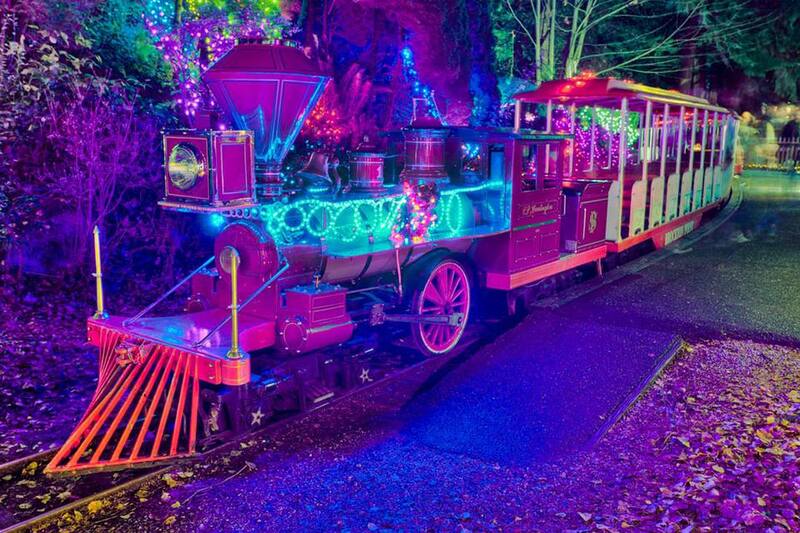 Every December, Stanley Park's famous miniature train transforms into the Christmas train and takes riders on a journey through a magical forest full of twinkling lights and fantastic Christmas displays. Along with the train ride, Bright Nights includes a chance to visit Santa and see the Parade of Trees. Make a visit from November 29, 2018, through January 5, 2019. Bright Nights is closed on Christmas Day. Coquitlam's Lights at Lafarge Winter Lights is one of the biggest free holiday light displays in the Lower Mainland. At Lafarge Lake, located about 18 miles (30 kilometers) east of downtown Vancouver, visitors can tour 100,000 twinkling lights at this magical outdoor display. You can hop on SkyTrain's new Evergreen Extension to reach the lights easily; just get off at the Lafarge Lake-Douglas Sky Train Station, which is the end of the line. You can see this spectacular display from November 28, 2018, through January 20, 2019. Arguably the most famous display of Vancouver Christmas lights, the incredibly dense and elaborate Festival of Lights transforms the gorgeous VanDusen Botanical Garden into a winter wonderland. It's not hyperbolic to say that the Festival of Lights goes all out, with festive decor everywhere you turn, from a dancing lights show to candy cane trees, gingerbread walks, and Santa's workshop, among many more displays. Be prepared for total Christmas immersion from December 1, 2018, through January 6, 2019. The botanical garden is closed on Christmas Day. The lights on four trees will be turned on at the Vancouver Art Gallery at Robson Square from 6:30 to 6:45 p.m. on November 30, 2018. The lighting party goes on from 6 to 7 p.m. and includes live entertainment and food trucks. The trees stay lit throughout the winter holidays. One of the most uniquely Vancouver Christmas lights displays takes place on the water (naturally). Carol Ships, decked out with elaborate Christmas lights, parade through Vancouver's waterways in nightly processions. To go aboard the Carol Ships costs money, but it's free to watch the spectacle at any of the shoreside Carol Ship events, including Carol Ship watching and bonfires in North Burnaby and West Vancouver's Dundarave Park. The ships cruise throughout December. Check the website for dates and times.